Miso soup is one of the most frequently consumed foods in Japan. It is eaten by three quarters of the population at least once a day (during breakfast, lunch, and/or dinner) and over 80% of all miso paste (including white miso paste, red/brown miso paste, and barley miso paste) is used to make it. This humble soup forms a crucial component in most traditional Japanese meals, and all typical Japanese households know at least one, but often several, miso soup recipes. 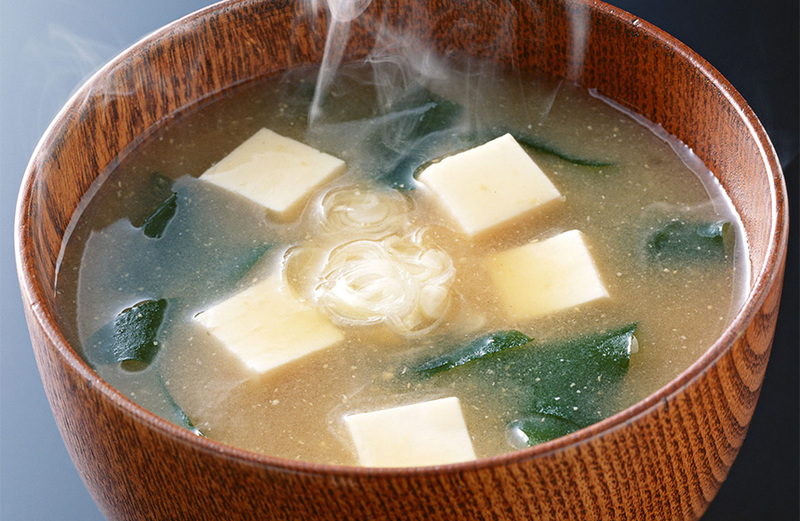 Continue reading to discover everything there is to know about miso soup. If you are looking to buy miso soup or miso soup ingredients, browse japancentre.com’s extensive Miso section. It is believed that miso was introduced to the Japanese by Chinese Buddhist monks in the 6th or 7th Century AD. It was originally eaten either as it was or spread onto other foods, but then samurai warriors started to enjoy a basic soup made from miso paste and a savoury broth during the Kamakura/Muromachi periods. This miso soup then trickled down into the diets of the more common people, where it has remained a prominent component of the Japanese diet ever since. In its most basic form, a present-day Japanese miso soup is a combination of dashi soup stock and miso paste, served with some sort of topping. These three miso soup ingredients inspire large amounts of variation, from the type of miso paste used, to the base ingredients in the dashi, to the type and variety of toppings used. Traditional miso soup is made from scratch, with miso paste and prepared toppings being stirred through hot dashi. Nowadays many prefer the quicker method of using instant miso soup sachets. These sachets come with everything included, and can be made into great-tasting miso soup in seconds by adding hot water and stirring. Miso soup has a uniquely hearty and mellow flavour that is rich in umami. Enjoying miso soup as part of a larger meal will enhance the flavour of the other dishes as well as provide flavour contrast. Miso soup is traditionally served in wooden or lacquered bowls. It is drunk directly from the bowl (no spoons whatsoever), and any remaining toppings can be fished out at the end with chopsticks. This smooth and slightly chewy seaweed has a subtly sweet flavour that nicely counterbalances the umami taste of the miso and dashi. The chewiness adds bulk to the soup, as well as providing a contrasting texture. Cubes of tofu give miso soup extra bulkiness, and firm tofu in particular provides a nice contrast in texture. Tofu does not have a lot of flavour of its own, so it is nice for adding to soups with subtler flavours as the tofu will not overpower the soup. Spring onions have an intense savoury flavour that works well in many miso soups, although care might need to be taken to ensure the onion does not become the dominant flavour of the soup. Spring onions also add an element of crunchiness. Aburaage, or deep-fried tofu, will bulk up a miso soup. It also acts like a sponge, soaking up the surrounding miso soup and becoming doubly tasty when it is fished out of the miso bowl with chopsticks and eaten separately. Japan Centre has a great range of miso products, from white or red miso pastes to instant miso soups. Check out japancentre.com’s Miso section for our whole range. If you are a fan of Japanese food and cuisine, or even if you have travelled to Japan, it is pretty certain that you have tried miso soup before. You may have tried instant miso, ready in less than a minute and available in a variety of flavours. After one too many pigs-in-blankets, a near-empty Quality Street tin down (apart from the orange creams, we’re not mad) and Baileys running through our veins it’s time to take off the gluttony glasses and kick start 2013 with a healthy-eating plan you can easily stick to and tastes amazing.